Rue Montorgueil (it’s hard to say, isn’t it?) is a street located in both 1st and 2nd districts of Paris. 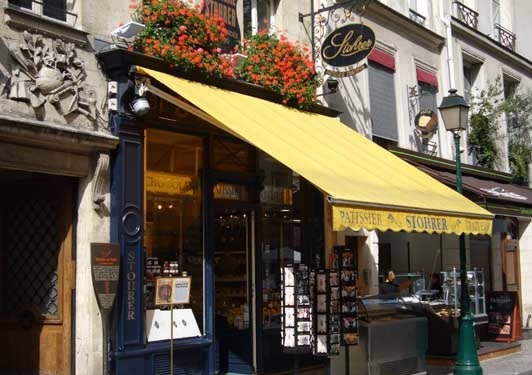 Lined with restaurants, bistros, cafés, bars, bakeries, stores (fish, cheese shops, wine, fruits and vegetables) shops, rue Montorgueil is one of the famous places in Paris, where Parisians like to have a drink after work. It is surrounded with other nice streets: Rue Etienne Marcel, Rue Tiquetonne, Rue Montmartre… Rue Rambuteau also has many shops, and it extends from the Saint-Eustache Church and Forum Les Halles to the Centre Pompidou and the Marais (Rue Rambuteau becomes Rue des Francs-Bourgeois there). 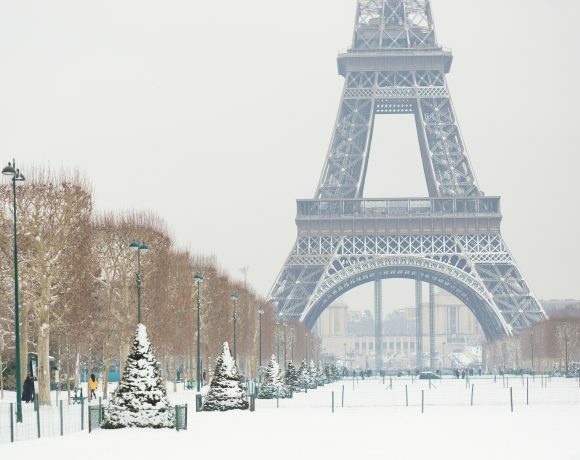 This is a pedestrian area in the heart of Paris where you’ll meet all types of Parisians Bo-bo (for “Bourgeois bohème”) or hipsters. Rue Montorgueil area is a village-cocoon in the busy center of the French capital. Here the heritage of the city has been preserved. Rue Montorgueil means “Mount Pride” and was named after the hilly area on which the street was developed. Historic houses are decorated with elaborate ironwork: go to numbers 17, 23 and 25. Some buildings also feature painted facades. Shopping First of all, it’s a nice area if you like shopping. Many brands are here competing with the Forum Les Halles (one entrance is Rue Rambuteau, just in front of the metro Les Halles exit, Line 4): it contains the largest indoor and underground shopping mall in centre of Paris. 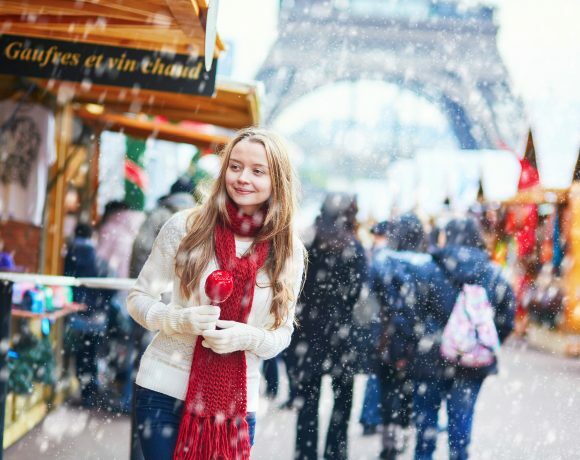 • Rue Montmartre – Yaya Store, 55: nice choice of “bo-bo” clothes – 58m, 58: perhaps the most specialized shoes store in Paris – Freelance, 54: French shoes store, made in France! Cocorico! • Rue Montorgueil – I love, 48: fashionable and nice colourful clothes – Leho, 17: cheap and chic is the leitmotiv here! • Rue Tiquetonne – Espace Kiliwatch, 64: the temple of vintage clothing – Pilone, 56: the best way to decorate your home sweet home with funny items! 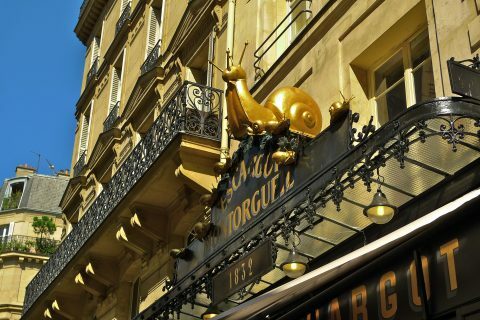 • Rue Montorgueil L’Escargot, 38: founded in 1875 by chef Mignard Jet Lag, 3: sunny terrace and friendly staff La Maison Stohrer, 51: this bakery was established in 1730 and is one of the oldest bakeries in Paris. The “baba au rhum” was created there. • Saint-Eustache Church Located at the beginning of Rue Montmartre/Rue Montorgueil, at the entrance of Forum Les Halles, the church was built between 1532 and 1632. It is considered as a masterpiece of late Gothic architecture. Young Louis XIV received communion there and Mozart also chose the sanctuary for his mother’s funeral. Today, the church is well known for its organ concerts. • Tower of Fearless Jean Located at 20, Rue Etienne Marcel, just a few steps from the metro exit, the medieval tower is known as La Tour Jean-Sans-Peur. You can climb a spiral staircase to visit some of the original rooms. The tower was erected in the early 15th century by “Fearless Jean”, the Duke of Burgundy. • Centre Pompidou Please read our article about the museum: “Paris Design Attitude – Andrée Putman & Beaubourg”. Metro: Etienne Marcel (Line 4), Sentier (Line 3), Réaumur Sebastopol (Lines 3 and 4). In one of the charming apartments you’ll find on Paris Attitude website!